There are very few people who enjoy going to the dentist. We may enjoy the feeling of clean teeth afterward, but the thought of going to an annual cleaning appointment can cause an insurmountable amount of fear and anxiety. Whether you hate every aspect of the appointment with your local family dentist or your teeth are uncomfortably sensitive, a gentle dentist can make the experience more bearable — maybe even enjoyable. If you are afraid of the dentist or have an extremely sensitive mouth, it is easy to feel embarrassed to admit. However, when you visit Mystic Oaks Family and Cosmetic Dentistry, you never have to feel self-conscious. According to an article on Colgate’s website, more than nine to 15 percent of Americans avoid the dentist. Put in other terms, that is 30 to 40 million people who have anxiety and fear about going to the dentist. You are not alone if going to the dentist makes you fearful. Gentle dentistry is focused on providing the same effective treatments for patients while making them comfortable during the experience. How do we do this? 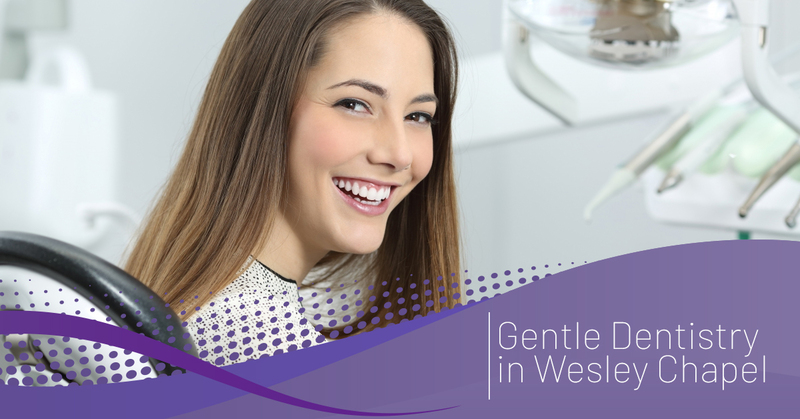 To learn more about the gentle dentistry options we offer in Wesley Chapel, instead of searching “dentist near me”, contact us! The compassionate staff at Mystic Oaks Family and Cosmetic Dentistry would love to help you feel as comfortable as we can during your visit.